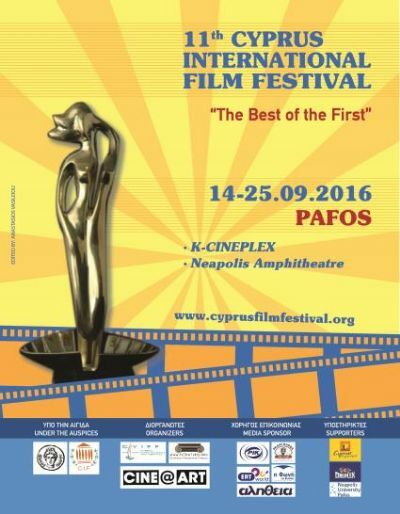 The eleventh Cyprus International Film Festival – The Best of the First – (CYIFF) will start in Paphos on Wednesday 14th September and screen 100 films in addition to a few parallel events that might even make you feel you are at the Oscars. The festival, that will run over a period of 12 days at both K-Cineplex the Kings Avenue Mall and at the Neapolis University amphitheatre, will include feature films, animations and documentaries from directors from 37 countries from around the world. All screened films will enter a number of competitions, the main one being the Golden Aphrodite for feature films, named to honour the goddess Aphrodite who is said to have been born in the waters of Paphos and is the reason why Cyprus is called the island of love. The films will also compete for the CYIFF Got Talent in Short Film competition, the CYIFF Veterans Shorts competition, the CYIFF Experimental/ArtHouse competition, the CYIFF Got Talent in Animation competition, the CYIFF Doc Talent competition, and the Veterna’s Short Film competition. The judges who will decide which film goes home with which award will include producers Vivek Singhania from India, and George F Roberson from the USA, the awarded film director Wang Jingguang from China, and director of photography Bill Butler – who worked on Jaws, Rocky II, III, IV, Grease and the Godfather. For a list of the films to be screened go to http://cyiff.cineartfestival.eu/en/festival/program/. Also during a number of the screenings there will be a Q&A session so you can ask about the filming process, the creative side of the action, or anything else you would like to know that goes on behind the scenes. Films shown at K-Cineplex will have an admission fee of €6 and those shown at the Neapolis University amphitheatre will be free. All proceeds from the Box Office sales will benefit a charitable organisation in Paphos. Now onto the parallel events. Next Wednesday holistic therapist and energy healer Thalia Alexiou will run a masterclass under the name Your Wheel of Fame from 10am until 4pm at the Idyllic Suite 48 in Paphos. Alexiou will describe what our wheel of fame is and how it works, she will teach all participants what the role of love is in our lives, and how the feeling of gratitude has to do with our success. There will also be a number of meditations happening and a chance to work one-on-one with Alexiou to make your dreams a reality. The cost for this session is €150 and you can book your place at thetapetra111@gmail.com. Also at Suite 48 on Friday and next Saturday, the film screenings will take a turn into a party mood when the CYIFF Moonshadows party will be on to open and close the festivities. The award ceremony will be held on September 25 at Technopolis 20 Cultural centre at 8pm.